This article is about the villager. For the Welcome amiibo currency, see MEOW Coupons. 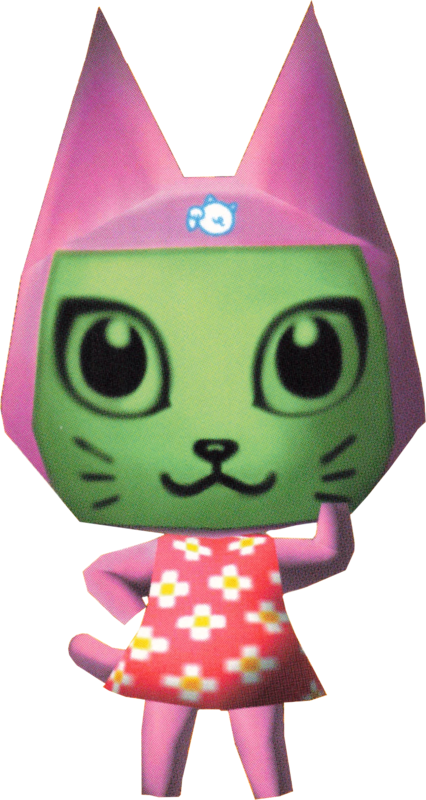 Meow is a peppy, cat villager from the Animal Crossing series, only appearing in Doubutsu no Mori e+. Her name and design are based on the MeowLingual translation device which translates cat sounds into distinct emotions that can be understood by humans. Her canine counterpart is Bow, whose name and design is based on a similar translation device for dogs, called the BowLingual. Meow can only move into a town after scanning her e-Reader card, which was exclusively bundled with Doubutsu no Mori e+ Figurine Series 49. Meow is a pink cat that initially wears the Blossom Shirt. She has pink paws, and a pink head with a darker pink on her ears and cheeks, and a green face resembling a monochrome LCD screen. Her face screen displays whiskers, and an unknown logo can be seen on her forehead. Meow is a peppy villager, meaning she will be friendly and excitable, coming out of her home often and rarely being discouraged from doing anything. Being a peppy villager, she will get along with normal, jock, and lazy villagers, but may annoy cranky and snooty with her upbeat personality. Modified on April 14, 2019, at 13:24.